Where to begin? Retirement planning is by no means an easy task, but it’s necessary. One of the key strategies for long term investing in my opinion is asset allocation. The other is diversification. Asset Allocation is a strategy used to leverage risk against reward by assigning a dollar value (or percentage) to a particular asset based on your risk tolerance level. For me, because I plan to retire 35 or more years down the road and a relatively aggressive risk tolerance, I have roughly 90% of my portfolio dedicated to stocks/equities and 10% to bonds. Because I have such a high percentage in equities, that gives me more exposure to the risks of the stock market, and less insured income from bonds. As I get closer to retirement, however, I intend to adjust my portfolio accordingly to secure more income by having a higher allocation to bonds and lower my equities exposure. So when my retirement date comes in about 35 years, my hope is that my asset allocation will have flipped to 10% in stocks and 90% in bonds. Some companies customize mutual funds with your retirement goals and risk tolerance level in mind. Vanguard has a list of all of their retirement balanced funds that are designed so that the asset allocation will be adjusted as the client gets closer to their retirement age. You can find that list here. They also provide IRA and individual/joint broker accounts, so if you’re looking to open an account, you can do so with Vanguard. Diversification is a strategy used to vary the content of your portfolio and to avoid a heavy concentration of money allocated to a particular stock, mutual fund, ETF or bond. When you have varying views or perspectives any business can benefit so even companies diversify their various portfolios. Companies offer multiple types of products to offset risks of only having one money generating product or to get into a new and growing business that aligns well with their current operations. We have a good bit of diversification, but we sill have a pretty high concentration in the healthcare industry. 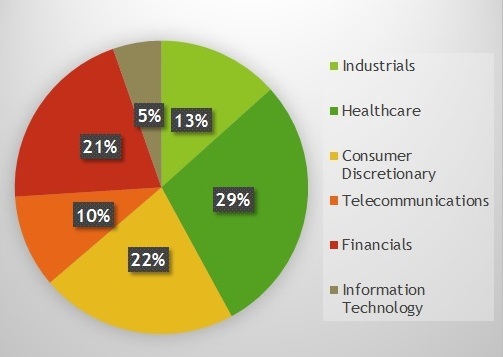 We are also heavily exposed to financials and the consumer discretionary industries as well. We intend to look for companies in the unrepresented or under represented sectors in our portfolio such as the energy, consumer staples and information technology sectors. Another option for diversification may be to look into international exposure through mutual funds. Asset allocation and diversification can be applied to all aspects of investing. By no means are these two principles limited to your retirement portfolio. You can have real estate, stocks/equities, venture capital pursuits and many other money generating streams to make up your wealth portfolio. How well you diversify your portfolio and allocate particular portions of your income in each is reflected in the outcome of your long term investments. Awesome. Thank you for your feedback! !